Flowers with tumbled stone petals in a hematite vase. 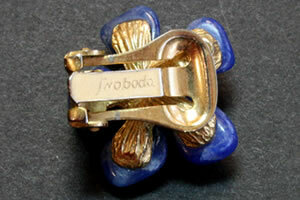 A popular Swoboda Jewelry brooch design. Tumbled stones include: yellow quartz, green peridot, orange carnelian, light blue turquoise, deep blue lapis, rose quartz, red garnet and green aventurine. Making Lemons into Tumbled Stones! The popularity of tumbled stones in the United States was kindled by a jewelry project launched by Edward Swoboda of Los Angeles in the early 1950s. Mr. Swoboda was a mineral dealer who received a shipment of tourmaline and beryl that was of lower quality than he had hoped for. He decided to craft some of the colorful specimens into smooth baroque shapes, polish them by hand and mount them in jewelry. His experiment was an enormous success. People wanted more jewelry than he was easily able to make by hand. What a great problem to have! He knew that he needed a way to mass-produce baroque-shape stones with a high polish. Mr. Swoboda collaborated with Warren Jones and they produced a "gem tumbler" that processed crushed gem materials into beautiful baroque-shaped stones. The concept of their machine was a rotating barrel into which crushed gem material was loaded along with water and coarse silicon carbide grit. The machine turned the barrel day after day as tiny pieces of grit were rubbed between the gem particles. This abrasion rounded the gem particles and smoothed their surfaces. After a few weeks, the pieces of gem material inside were tumbled into nice rounded baroque shapes with smooth surfaces. The stones were then sanded with smaller sizes of grit, then cleaned and buffed to a high luster in the barrel with a rock polish. This was the same procedure used when polishing stones by hand, except it was done in a barrel to many thousands of stones at a time! Now with a source of abundant polished stones, a company, Swoboda Jewelry, grew around a product line that consisted of colorful tumbled stones mounted on plated base metal settings. The first two photos on the right are examples of this type of jewelry. 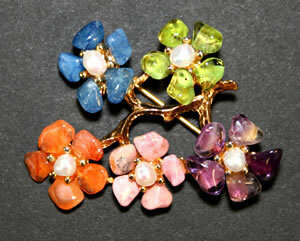 A Swoboda Jewelry branch holding five flowers with tumbled stone petals (carnelian, peridot, rose quartz, amethyst, blue quartz) and pearl centers. Swoboda Jewelry was something completely new. Natural stone jewelry at that time usually contained stones that were either faceted, cut en cabochon or cut into beads. Occasionally a cabochon cutter would be inspired to create a baroque shape to take advantage of a nice piece of rough or to minimize the loss of beautiful material. In contrast, pieces of Swoboda Jewelry consisted of a cluster of highly-polished baroque-shaped stones in the form of a flower or tree. Sets consisted of earrings and a brooch. People loved them! This popularity enabled Swoboda Jewelry to open stores in Los Angeles, New York, and Dallas. Swoboda Jewelry was also sold in quality department stores such as Saks Fifth Avenue, Bloomingdale's, Gump's, Neiman Marcus, Dillard's, Goldwater's, Marshall Field's and Harrod's of London. An important part of Swoboda's popularity was the quality of the stones used in the jewelry. Take a look at the photos on this page. You will see that the stones are prime color, with great clarity and brilliant surface quality and luster. They were carefully selected and skillfully matched into each piece. 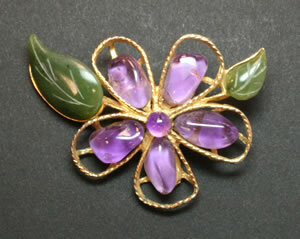 A Swoboda Jewelry flower brooch with beautiful purple amethyst petals and nicely carved leaves of green jade. "gemstones in natural, baroque shapes, uncut but highly polished." This was a great way to describe the stones! "Uncut" and "highly polished" were absolutely true! The Swoboda Jewelry product line grew into large collection of brooches, necklaces, earrings and other jewelry items. Each of the pieces was adorned with some combination of small tumbled stones, pearls, beads and simply-cut leaves. The third photo on the right shows an amethyst brooch accented with hand-cut jade leaves. 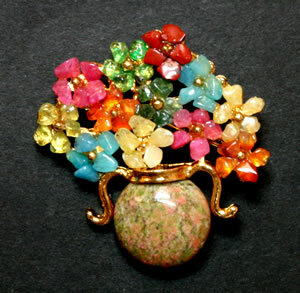 The fourth shows a brooch with flowers of rose quartz hearts and leaves of tiny tumbled aventurine. The jade leaves and rose quartz hearts were extensions beyond the tumbled stone beginnings. The sixth photo shows a pair of Swoboda floral earrings with lapis lazuli petals surrounding a central silver pearl. 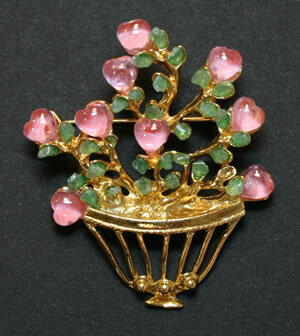 A potted plant brooch containing heart-shaped rose quartz flowers and green aventurine leaves. 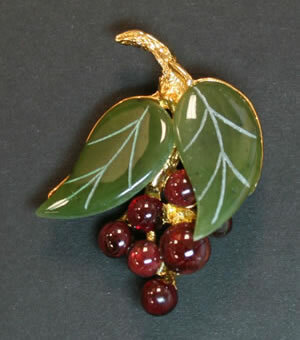 A cluster of red garnet cherries with jade leaves. This is one of our favorite Swoboda Jewelry pieces. 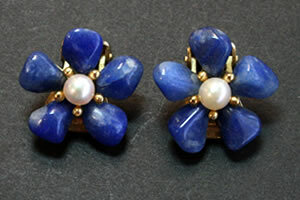 A nice pair of Swoboda flower earrings with lapis lazuli petals surrounding a silvery pearl. Most pieces of Swoboda jewelry have an obvious maker's mark. The name "Swoboda" or "SWO Inc" is part of the casting or engraved on a smooth surface. However, pieces of Swoboda jewelry made before 1966 were sold without a maker's mark. Instead they were sold with a gold and red foil hang tag. 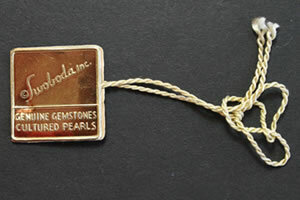 A red and gold foil hang tag on a gold thread was the typical marking of Swoboda Jewelry made before 1966. The larger pieces of Swoboda Jewelry had a maker's mark (Swoboda ©) cast into the piece. 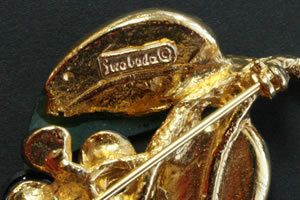 Smaller pieces of Swoboda Jewelry had the name "Swoboda" engraved onto the back of the piece. 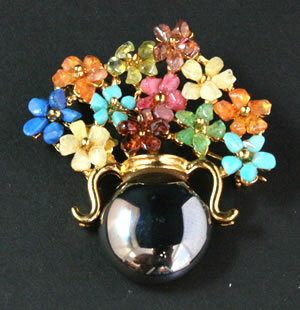 A Swoboda floral arrangement brooch. Flowers of citrine, aventurine. carneliana agate, yellow quartz, peridot and red jasper, each with a gold metal bead center are held in a vase made of pink and green unakite. Suddenly Everyone Wants a Rock Tumbler! How did Mr. Swoboda make the beautiful stones in his jewelry? A lot of people wanted the answer to that question! They wanted to make their own beautiful "tumbled baroques." Many ingenious people set out to reinvent his methods and a few of them were successful. Soon paint cans, old car tires, and an assortment of other containers were being loaded with crushed rocks and turned week after week to produce tumbled stones. It wasn't long before dozens of companies were mass-producing rock tumblers and selling them to rock shops and retail stores. In just a few years thousands of rock tumblers made by Lortone, Thumler's and many other companies were happily running day and night in basements, garages and sheds throughout the United States. That's how the rock tumbling hobby was started and how Swoboda Jewelry was born. If you want to learn more about early rock tumbling read our "History of Rock Tumbling" article. It explains how Swoboda Jewelry led to the founding of the largest manufacturer of tumbled stones. 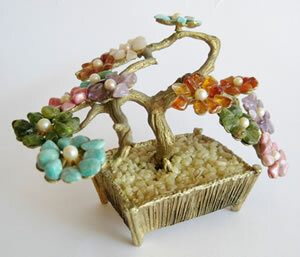 Swoboda Jewelry also made some wonderful gemstone trees such as this one featuring tumbled stones of many colors. Photo by Ilze Kuhlman. More Swoboda Gem Trees. Swoboda Jewelry was not confined to tumbled stones. Many Swoboda flowers had a round pearl in the center (see earrings and the gemstone tree in the right column). Beads were used to represent fruit on trees and vines (see the cherry brooch and the potted plant brooch in the right column). And, cabochons were used to make some of the more traditional pieces (see the lapis and opal brooch below). The Swoboda Jewelry company operated until 1979. Today, Nate Waxman, a long-time Swoboda Jewelry employee and designer, produces and sells limited reissues of vintage Swoboda Jewelry designs. Original Swoboda Jewelry pieces are now sold by many vintage jewelry dealers and regularly appear at online auction sites. That's where we obtained a lot of nice Swoboda pieces. Some Swoboda pieces departed from the tumbled stone format. Cabochons, beads and pearls were also used in Swoboda jewelry and rarely a faceted stone. 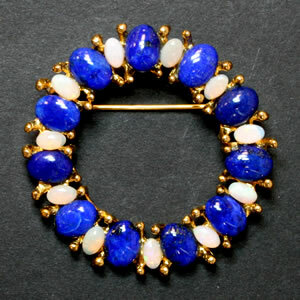 The brooch above features beautiful lapis and opal cabochons. Are You Missing a Petal or Leaf? Occasionally someone reads this article, realizes that they are on a site that sells tumbled stones and wonders if we have matching stones for their piece of Swoboda jewelry with a missing leaf or petal. Matching stones for Swoboda jewelry are very hard to find. Why? The tumbled stones used in Swoboda jewelry are usually supreme specimens. Remember reading above that Swoboda's initial venture into baroque-shaped stones was that he received some faceting rough that was a little disappointing? There is a big difference between #2 grade faceting rough of the 1950s and 1960s and what is used to make commercial tumbled stones today. Take a look at the tumbled stones in a piece of Swoboda jewelry. They are generally in the prime of color, with clarity and surface quality that are far above average. Finding a perfect match simultaneously in color, size, shape, clarity, surface quality and luster is going to be very hard to do - just like the challenge that a pearl dealer has in producing a matching strand of pearls. If you purchase a bag of our extra small natural mix you will probably not find what you are looking for. The rough used for tumbling today comes from different sources than where Swoboda obtained their stones. Nice green peridot, cherry red garnet, solid blue lapis and other Swoboda materials are rarely seen in commercial-grade tumbled mixes today. To save you time and money, send us a very clear photo of your piece taken outdoors on an overcast day or indoors under indirect daylight illumination and we will let you know if the material you need is found in our mixes. Include a penny in your photo for scale. We can usually answer "yes" or "no" at a glance.